you can trade in your Old House for a brand new FULTON home. Would you love a new Fulton Home in one of our vibrant new communities, but feel that you can't get out of your existing home? Would you like to take advantage of historically low prices and interest rates, but feel stuck in your old home? You're not alone, but we can help. Trade In (Equity required) - Fulton Homes agents will simply buy your home at a mutually agreed upon discounted price and you purchase a new Fulton Home. Listing Program - Fulton Homes and their agents agree to list your home at a reduced commission in order to purchase a brand new Fulton Home. Lease Program (No equity required) - Fulton Homes and their agents set up guaranteed lease assistance for up to three years on your current home with no management fees, when you purchase a brand new Fulton Home. Why live in an Old House when you can live in a brand new energy efficient Fulton Home? Fulton Homes Trade In Program offers many options for buyers who need to sell or lease their homes before they buy. Even with no equity in your present home, or even negative equity, we will help you explore all of your possibilities for free. We care. Contact us using this form or visit any of our sales offices and speak with one of our knowledgeable agents to see if you qualify for our trade-in program. After our son was born, my husband and I started looking for a new home. With a growing family, we needed more space. 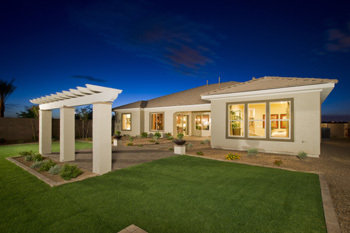 We looked at several builders and resale homes, but quickly decided that we wanted a new home at Fulton Ranch. The location was perfect and the homes were simply great. But, we were worried that we weren't going to be able to get out of our existing house. We talked to several realtors who were downright pessimistic about us being able to cover our debt. Our old neighborhood had several foreclosures (one right across the street) driving prices down. We felt stuck. We looked at renting our old home, but really didn't want to be landlords. It seemed pretty certain that our dream of buying a new home was not going to come true. But, then we talked to a Fulton Homes a sales agent about Fulton's Trade-In Program. Fulton set us up with a real estate agent who had experience with people in our situation. They were great. After exploring our options, they helped us list our house for a fair price. Although my husband was convinced that we'd never be able to sell without taking a big loss, we were able to successfully close on our old house and get out exactly what we needed to get into our new Fulton home. Thank you Fulton Homes, for making our dream of owning a new home possible!